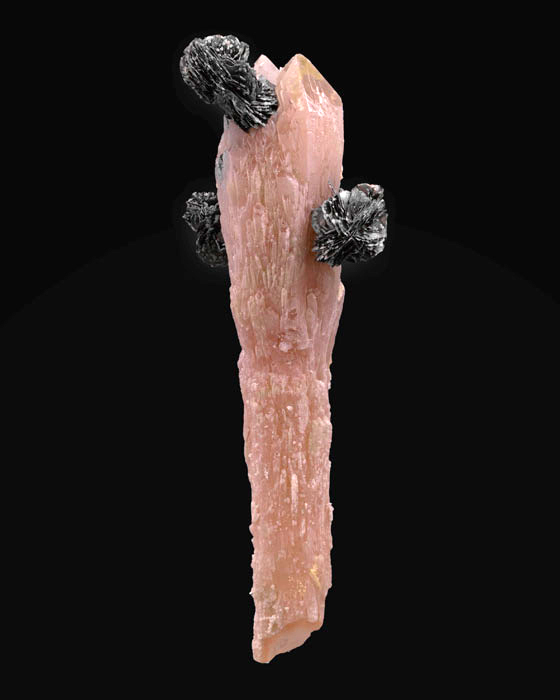 An excellent specimen from a recent find in Inner Mongolia, with hematite included quartzes measuring 8.2 cm in length, tapering on one end and rehealed at the other. The soft pink contrast in association with discs of hematite is appealing as well. 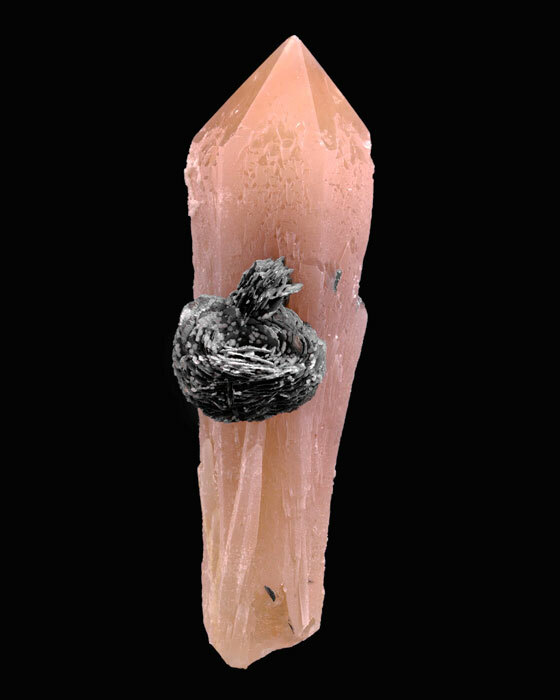 This is a particularly balanced display of isolated hematite to 2 cm on sharply terminated quartz that is not only glassy but gives off a lovely peachy pink glow. 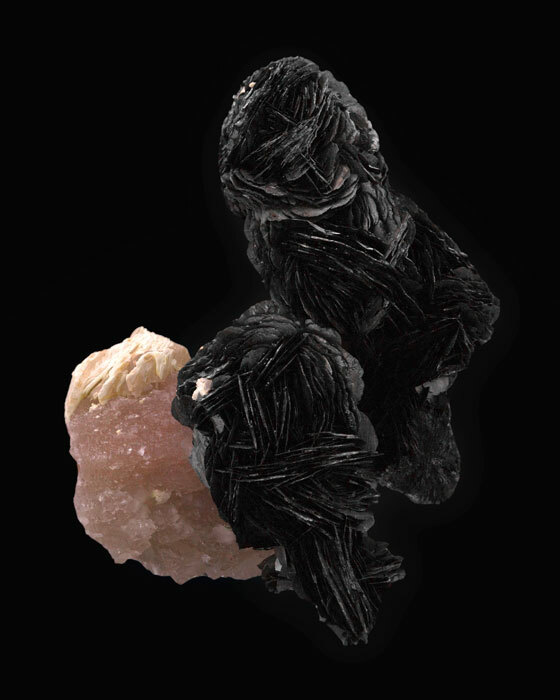 The secondary white quartz dusting accentuate the hematite. 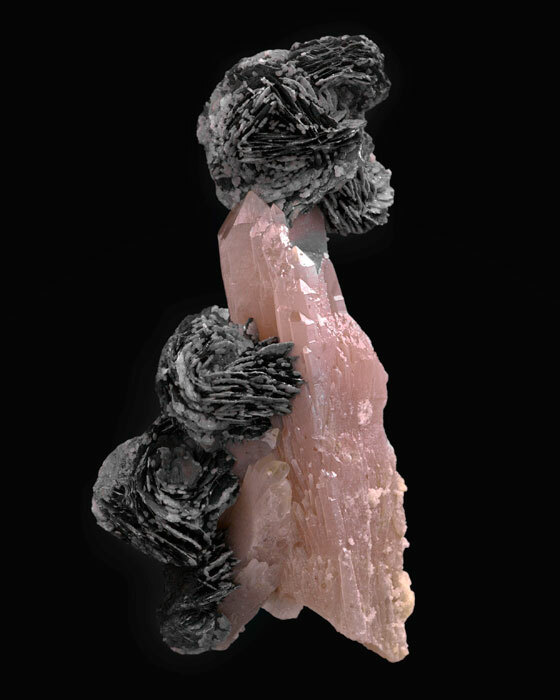 An outstanding specimen featuring metallic silvery hematite, with each rose sitting perfectly on pink-tinted, rose-red quartz. 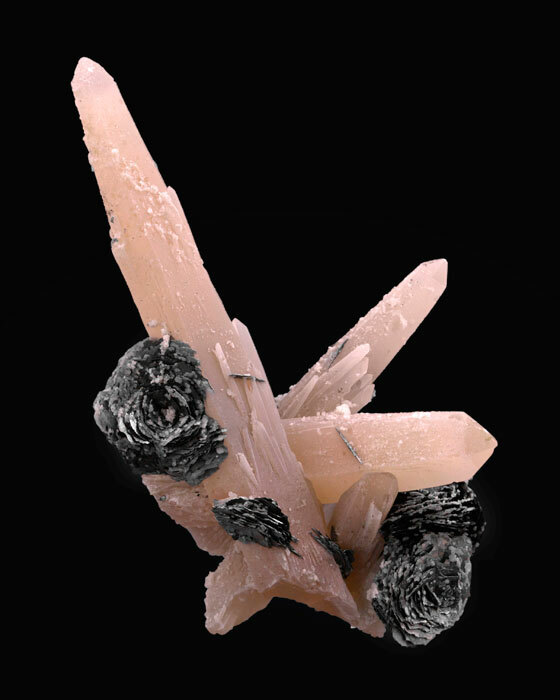 The white dusting is attractive, being a thin coating of quartz, enhancing every petal of the hematite rose. A remarkable specimen that is practically a floater. 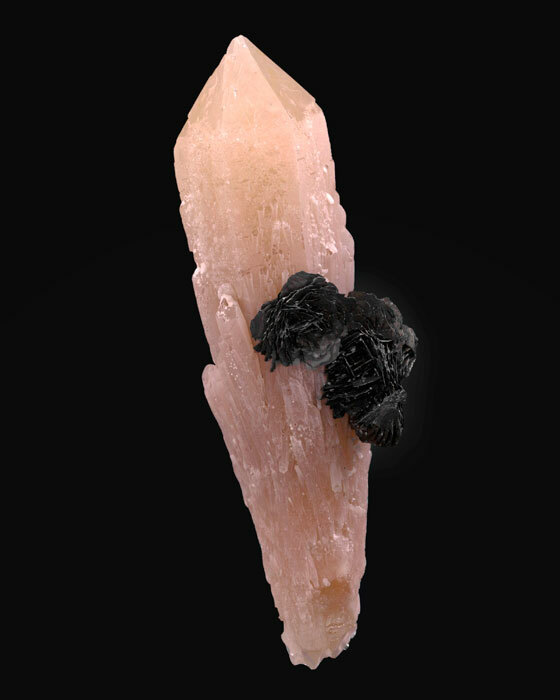 This sharp, well balanced and intact quartz scepter sits with matte black rose petals of hematite. Slight contacting on left side, but very fine nonetheless. 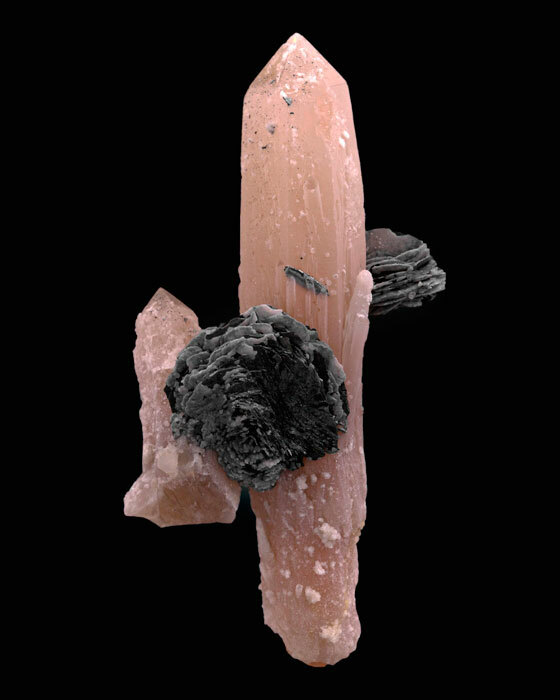 Isolated hematite roses to 1.7 cm sit well balanced at the edge of soft peachy pink quartz. It includes preferential coatings of white quartz, undamaged terminations and a rehealed base. 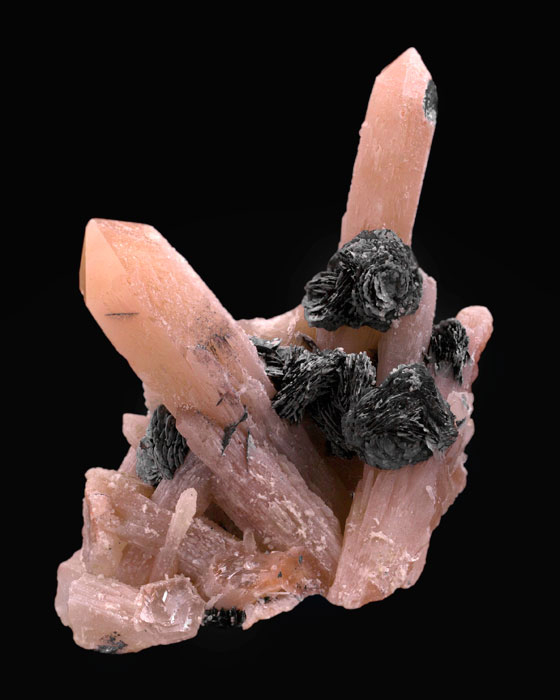 An appealing specimen with several rosettes of hematite perched on light pink included quartz. The crystal groups to 2 cm are well formed, metallic and slightly etched. As seen in the photo the overall features are fascinating. 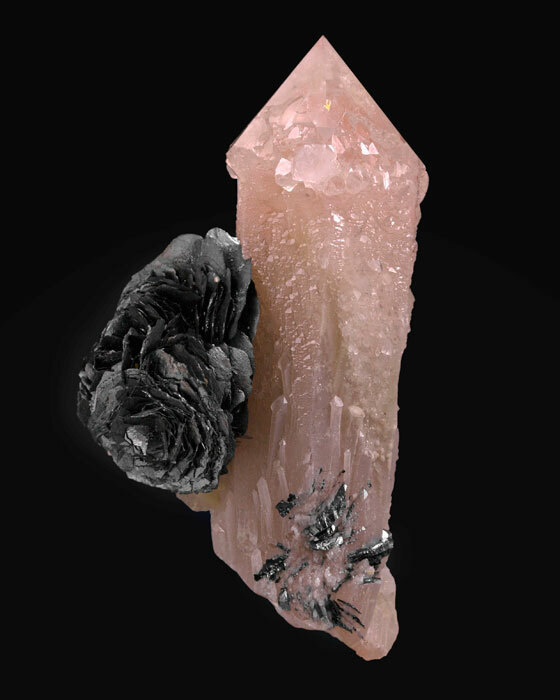 A lovely pink translucence of quartz with pinkish hematite inclusions topped off by roses of hematite, some of them having a thin coating of white quartz, making it all the more attractive. The largest cluster is 2.4 cm. 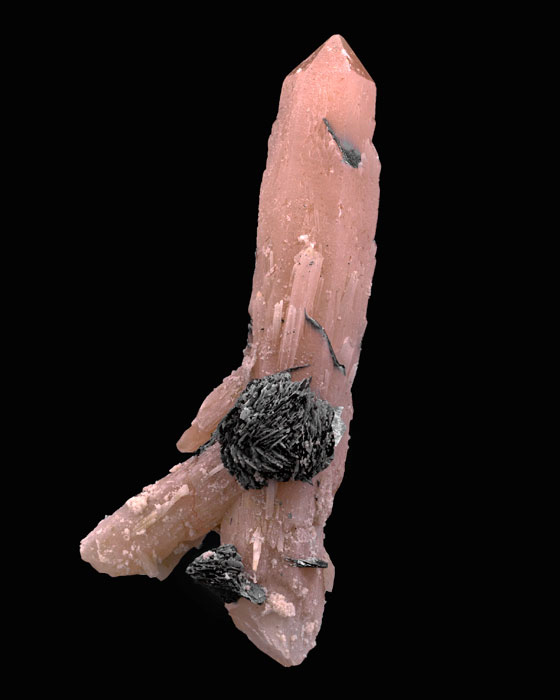 This specimen has several rosettes of hematite perched on light pink quartz. The grouping is 5 cm in length, metallic and slightly etched. Great combination specimen from this contemporary soon to be classic locality. 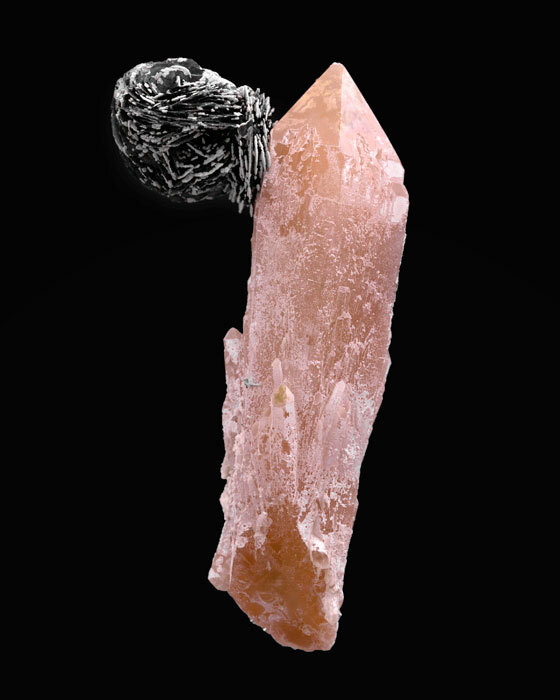 This single of pink-tinted quartz is included with hematite, and the tapered crystal itself is doubly terminated. There is a particularly fine display of rose petals of flattened habit. This is an excellent combination specimen from a recent find in Inner Mongolia, with a lot of rich definition. This white dusting is a thin coating of quartz, highlighting every petal of the hematite rose. 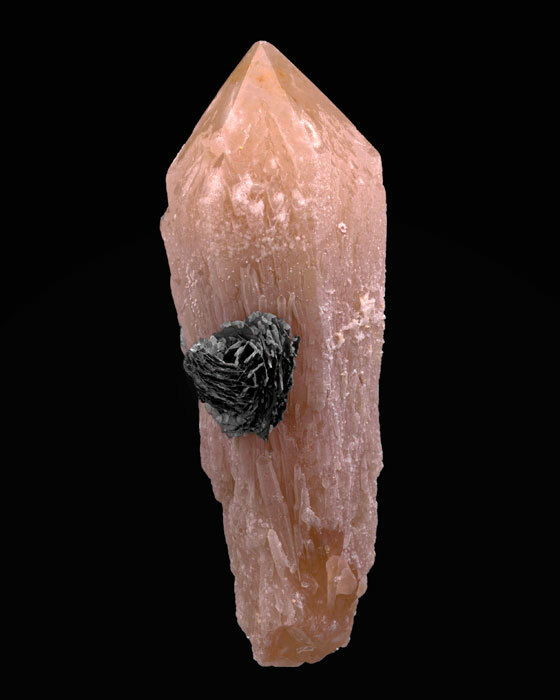 The largest one at the top edge is 2 cm, and it sits on a stem of doubly terminated, rehealed quartz. 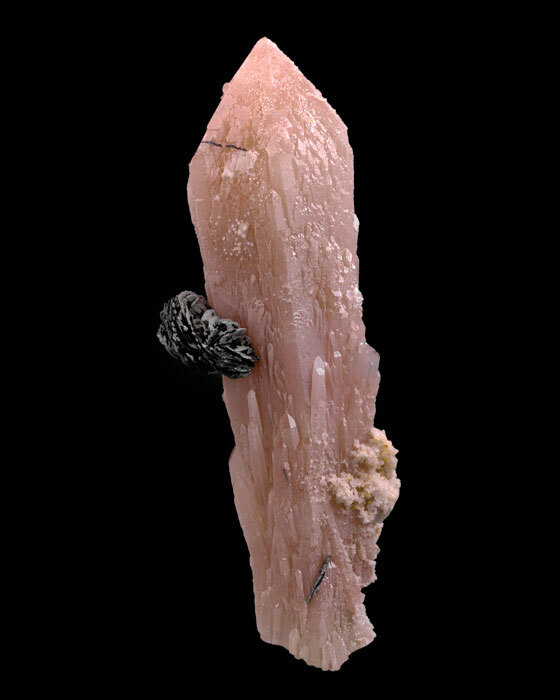 This is a particularly fine display of isolated hematite to 2 cm on sharply terminated, lovely peachy pink translucent quartz. The thin frosting sparkles, which gives the piece an interesting appearance on otherwise shiny faces. 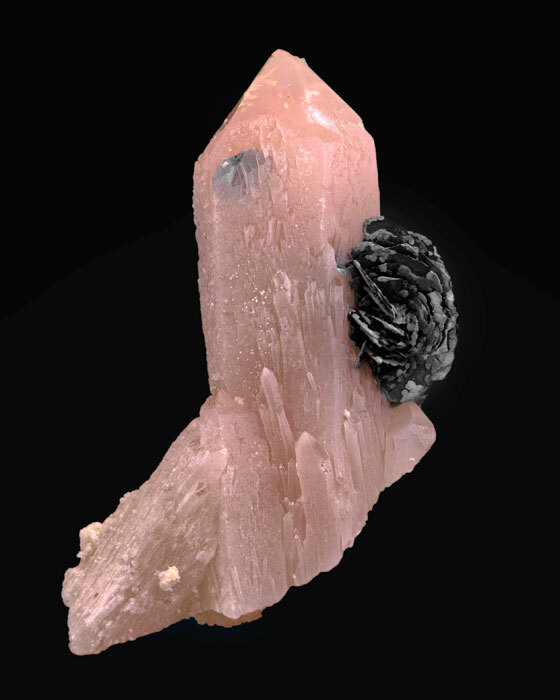 An appealing specimen with several rosettes of hematite perched on light pink quartz. The partly coated hematites are made up of thin blades, metallic and slightly etched. Slight contacting on back, but very fine nonetheless. 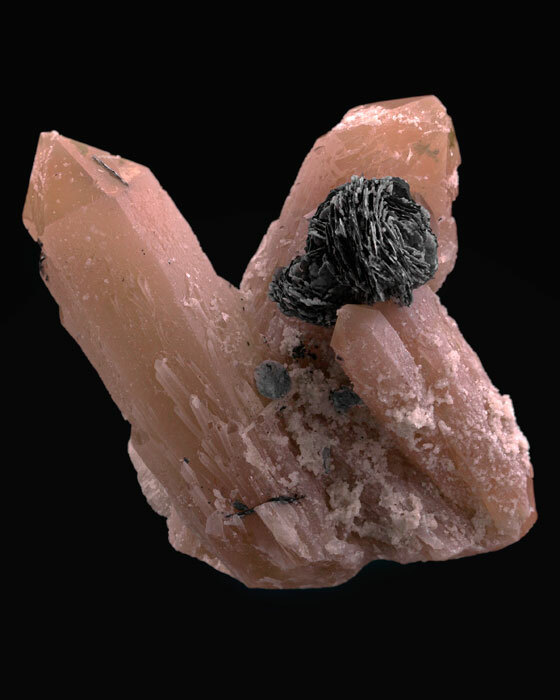 This is an exceptionally fine spray of translucent peach-pink quartz, and atop this specimen, two intergrown clusters of hematite sit nestled. The base is incomplete, but terminations are perfect. A great combination specimen from this contemporary soon to be classic locality. 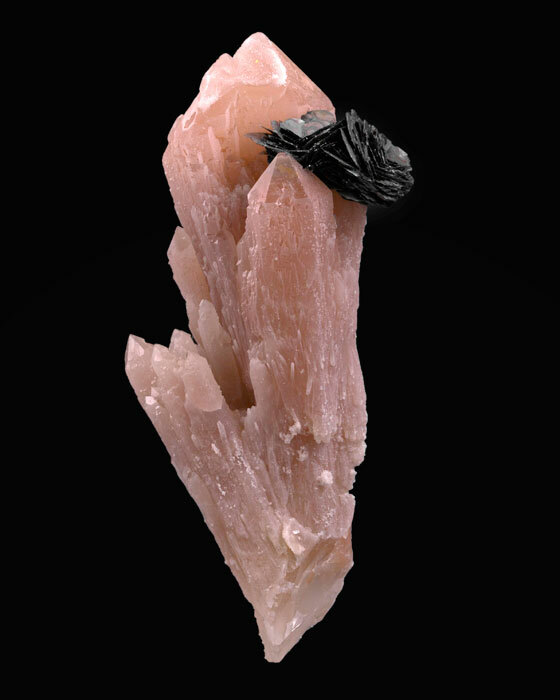 This hematite included quartz is a sharply terminated and pinkish cream colored. The secondary white quartz dusting accentuate the hematite. 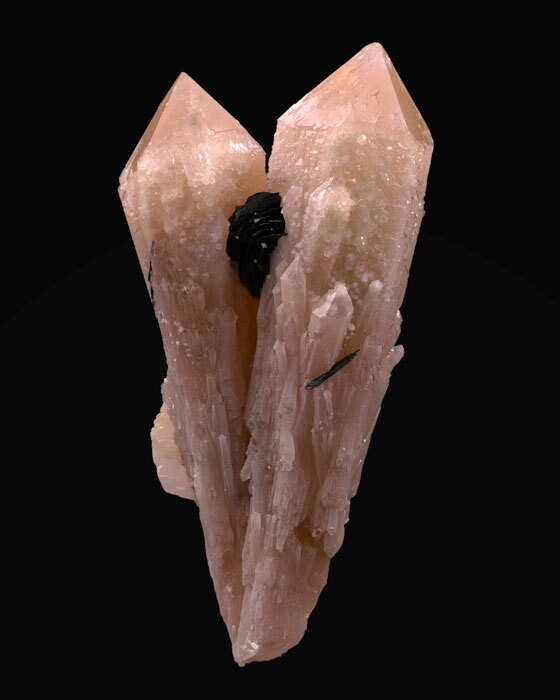 A V-shaped pair of quartz crystals form complete and undamaged terminations. Despite being a bit buried the hematite sits sandwiched in the middle. 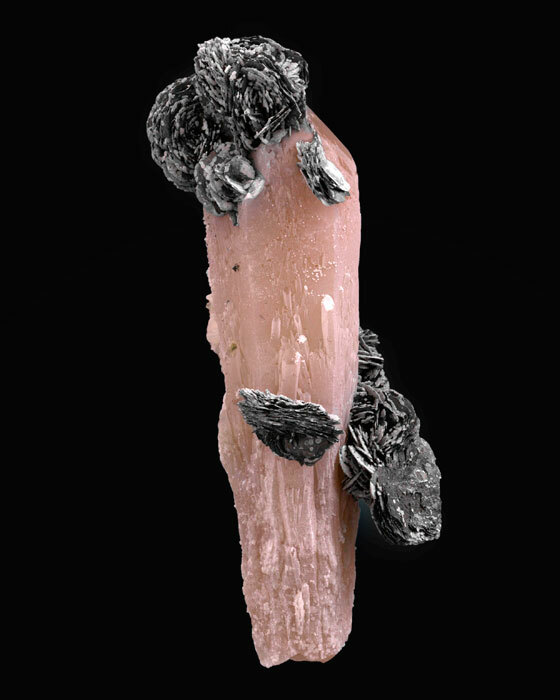 An attractive and distinctive specimen with several rosettes of hematite clinging to rose-red quartz, some of them having a thin white coating, making it all the more attractive. 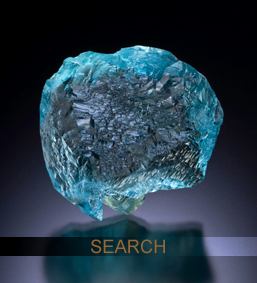 The crystal groups are well formed, metallic and slightly etched. 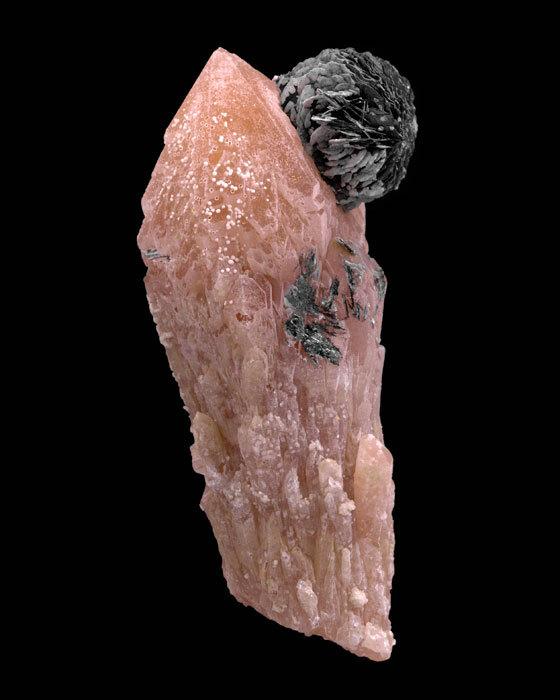 Isolated hematite rose sits well balanced at the edge of soft peachy pink quartz, with preferential white coatings of quartz. The termination is undamaged, base rehealed and complete all around. This thin frosting sparkles, which gives the quartz an interesting appearance on otherwise shiny faces, accentuating hematite even more. The base is incomplete, but termination is perfect. This floater is a two-sided display piece, with bottom ends undamaged and actually well terminated. A fine cluster with discs of hematite to 1.7 cm. 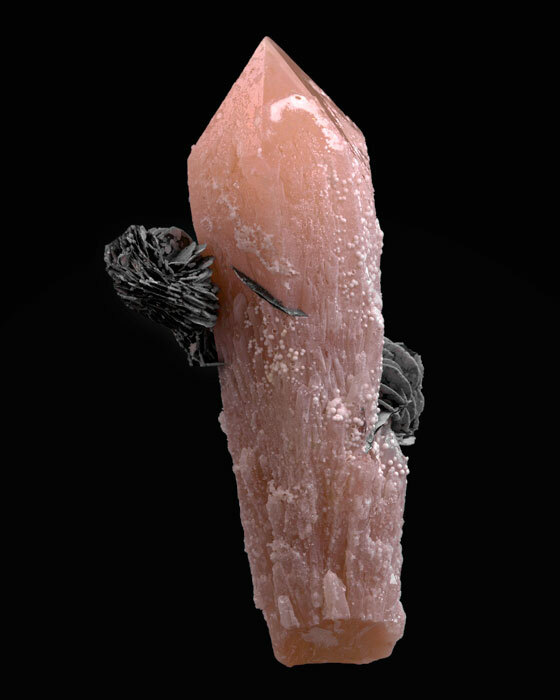 This quartz crystal is pinkish cream colored and well terminated. The thin frosting sparkles, which gives the piece an interesting appearance.